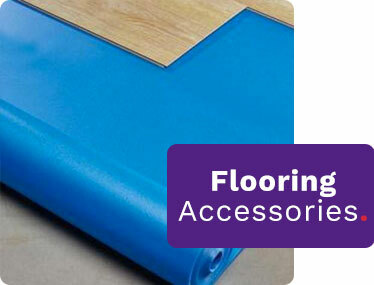 Flooring Accessories With Underlay, Beading & More! Choosing the correct floor for your home or business is never easy as there is so much choice. Given the sheer amount of time you spend on your floor, there’s just no reason why your floor doesn’t deserve your utmost care and attention. Here at Factory Direct Flooring, we aim to provide you with everything you need to make the most of your brand new floor. Whether you have chosen a solid wood floor and need cleaning tools, or if you are half way through fitted carpet and need special carpet glue or just the right beading to suit your style and needs. Choosing the right flooring accessories can be even more difficult if you're not sure exactly what supporting products you need. If you're installing a new floor - you will require an underlay or an adhesive of some description. Whereas if you are preparing for spills and floor damage, you might be looking more at our floor cleaning and maintenance accessories. The ongoing maintenance and cleaning of your new floor is imperative as it can extend the life and appearance of your new flooring. We recommend to all of our customers to accompany their purchase with the right cleaning and maintenance kits so that, in the case of solid wood flooring, you are able to keep that stunning new wood look for long after its installation. If you would like advice on what accessories best suits your needs, then please give us a call today on 0330 100 00 15 and speak to our friendly team who will be more than happy to help you.